More than 500 people attended. Most were health care professionals, mainly oncologists but also primary care physicians, family physicians, nurse practitioners, and others. Attendees came from as far away as Japan and Australia. Patients were in the minority and we are working to increase our voice at these events, especially since the medical community has been recognizing the need for a patient-centered approach. For example, I had seen online and heard at the conference remarks that no patients had been on the planning committee, but that is not true. 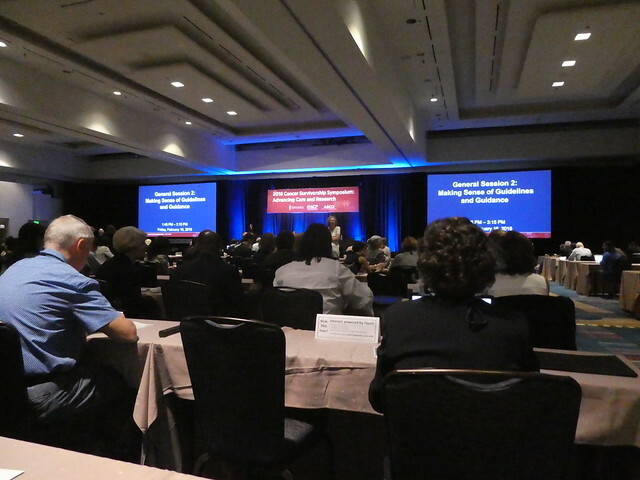 Patient advocate Jack Whelan had been on the committee; he had died in November from blood and prostate cancer and was remembered and recognized during the opening remarks of the conference. The National Coalition for Cancer Survivorship, a cancer patient advocacy organization, held a breakfast meeting for patients. NCCS also maintained an exhibit. So did Annie's Appleseed Project, a nonprofit founded by Ann Fonfa, a cancer patient studying natural alternatives in combination with conventional cancer treatments. The Saturday networking luncheon included a workshop partnering patient advocates and clinicians -- and within that workshop we had a table dedicated to communication between patients and clinicians. At that table I sat next to a long-term survivor of Stage IV colorectal cancer who is currently NED (no evidence of disease -- what some call "remission"), and at least half of those at our table were cancer survivors. 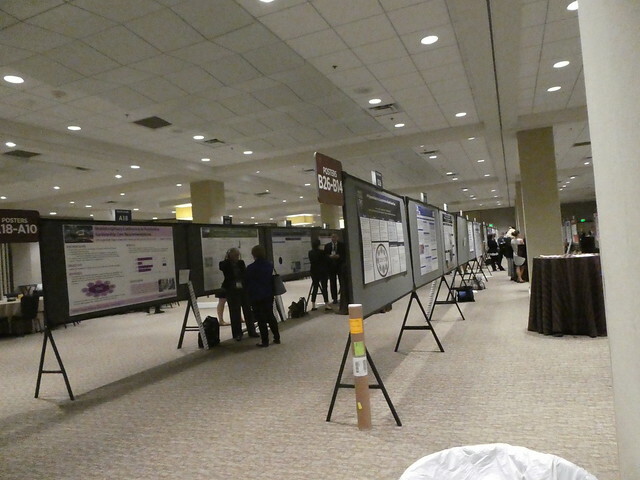 I counted 42 presenters giving talks, of which two spoke on patient perspectives. Of those, Scott J. Capozza was also a health care provider, being a physical therapist, and spoke on exercise. The other, Samantha Watson, presented The Samfund, a financial aid program for young adult cancer survivors. The dais therefore contained two patient voices, each with a narrow focus. A fair number of clinicians at the conference are themselves cancer survivors and could therefore speak to both sides of the equation, even though their role as clinicians was more strongly emphasized. During each presentation, attendees could submit questions and comments electronically or step up to microphones during the Q&A session. I made it my mission to make myself visible as a cancer patient. If I could contribute anything to the discussion I stepped up to the mike and identified myself as a breast cancer patient. I did so for the general sessions on guidelines, on health promotion, and on continued treatment, particularly as it related to hormone therapy. I also gave input during the two networking lunches (roundtable discussions) I attended. The first was on building a community survivorship program; the second was on patient-clinician communication. My input was well received in all cases, and I was approached by a couple of clinicians wanting more info. The conference included a dedicated online network and mobile app, which worked intermittently. People had better luck using regular WiFi. Patient advocates who wanted to share contact information got a list ahead of time of our colleagues so that we could keep in touch. The conference had its own hashtag (#SurvOnc18), which many attendees used to live-tweet talking points and pictures of slides in real time. The conference also provided continuing education credits to attending professionals and students. Next year's conference will return to the San Francisco. Stacey Tinianov (@coffeemommy on Twitter), a fellow breast cancer patient whom I know through Breast Cancer Social Media (#BCSM) told me that this conference was smaller than the first two had been, in San Francisco and San Diego. a. Communication and coordination between oncologists and PCPs is crucial and the need for it will only increase, but PCPs feel unprepared. Primary care physicians (PCPs) and other general health care practitioners need training in survivorship and a survivorship curriculum must be a component in medical schools. A conceptual framework for cancer survivorship needs to be developed and accredited. Survivorship is its own special area, much as emergency medicine differs from general medicine and geriatric medicine differs from medicine for other age groups. There's a gap in survivorship training for good reason: Many more people are surviving cancer. Years ago survivorship was not an issue or not enough of an issue because we didn't have the critical mass of population that exists now. When the National Coalition for Cancer Survivorship was established in 1986, there were only 5-6 million cancer survivors in the US. In 2017 there were about 15 million survivors, and more than 18 million survivors are projected for 2022. Nurses and PCPs tend to receive general cancer training but not survivorship training, and some facilities have established their own survivorship training programs that they offer to the health care community. Survivorists -- those health care professionals who deal with cancer survivorship -- often feel isolated from the rest of the health care world, which is why this conference began in 2016. By 2025, the demand for survivorship care will overtake the number of oncologists to meet that demand, which makes coordination with PCPs all the more urgent. Genevieve Chaput (McGill U) found that most PCPs said they didn't feel competent in caring for cancer survivors, and that lack of communication with specialists and lack of knowledge were barriers to survivorship care. A survivorship workshop for PCPs on late effects (cardiac toxicity, anxiety/depression/distress, cognitive dysfunction, fatigue, pain, sexual health issues, sleep disorders) and preventative health resulted in 99% of participants saying they would make positive changes to their practice, with confidence levels remaining high three months post-workshop. More specialized workshops were also requested and are being given. Survivors who receive chronic therapy are of special interest here, because they develop complications and comorbidities outside the sphere of oncology. PCPs may not feel confident in handling these complications. Larissa Nekhlyudov (Brigham and Women's Hospital) found that PCPs want information and find it useful, but need it in a simple format (cancer diagnosis, date of diagnosis, location of treatments, potential for late effects) that is easy to find. It should be accessible in an electronic medical record (EMR) or print version and made available 6-12 months post-treatment. SCPs are analogous to a hospital discharge summary. Barriers include lack of common-sense accessibility. For example, in the EPIC patient portal the SCP was accessible only by navigating multiple menus and knowing where to look within them. Many PCPs surveyed hadn't seen SCPs and didn't know where they were located. Linda Overholser (U Colorado School of Medicine) found that a barrier to providing survivorship care in the PCP setting involves the lack of "discrete, actionable" guidance. Oncologists face multiple guidelines from different organizations and a lack of consistency among them; stakeholders in those guidelines often omit PCPs. PCPs face a different set of multiple guidelines with the same issues. These guidelines change over time and have no universal consensus. This makes shared decision making all the more important, along with the role of technology in providing decision support for both patients and providers. Most PCP guidelines are not risk-based and focus on patients who are asymptomatic, whereas oncology guidelines have begun to focus more on a risk-based model (in addition to age-based and symptom-based models). Risk-stratified care management is the gold standard. Additional considerations include comorbidities. One study found that ~23% of the general population has more than one chronic health condition; that rises to 65% of people over 65. Notably, the study did not include cancer as one of the conditions. Similarly, the American Heart Association's risk calculator does not take cancer into consideration. Cardiovascular disease as a late effect of cancer treatment has been studied more in people who had childhood cancers than in those with later-onset cancers. Managing risk factors must include considerations of both financial toxicity and side effects (e.g., the use of statins for cholesterol management). PCPs are under tremendous pressure to avoid unnecessary testing and decrease health care costs. b. Resources (time, money, personnel) and the lack thereof are major factors in SCP implementation. Implementing SCPs adds another layer of paperwork along with maintaining electronic records. Graham Warren (Medical University of South Carolina) said his wife, a PCP assistant, had seen 126 patients by herself over the course of a 12-hour day ("one patient every 5-1/2 minutes for 12 hours with no bathroom break and no lunch"); he said his limit was 72 patients in a day. When he asked for a show of hands, many people indicated that they saw more than 50 patients in a day. Another presenter talked about the high rate of turnover in rural resource-strapped facilities. SPCs are not one-size-fits-all but must be tailored to the culture of the individual facility. There must be an efficient use of staff and ways found to minimize burdens on both the practitioner and the patient, while still making survivorship care a collaborative process. Arti Hurria (City of Hope) had designed a touch screen form that patients could fill out while they waited for their appointment. Online learning platforms for health care professionals, the use of telemedicine, and models of self-management for patients can all improve the process. Deborah Mayer (UNC Chapel Hill) reiterated that the SCP is meant to be a transition tool to foster discussion of what comes next. It should be reviewed periodically and is not a one-time single piece of paper. This holds especially for patients with advanced cancers and should cover what the current treatment is. Patients prefer receiving SCPs sooner rather than later (i.e., as soon as treatment ends). Lawrence Shulman (Abramson Cancer Center) advises giving SCPs to patients within a year of diagnosis or within 6 months of completing active treatment. SCPs do not replace face to face discussions but are adjunct to them; however, they can be administered by teleconference. SCPs were initially designed for patients treated with curative intent. They are needed for Stage IV patients as well, but "we had to start somewhere" and the Commission on Cancer (COC) Survivorship Standard "is the only action that has gotten survivorship on the radar for cancer programs." The COC standard is multidisciplinary and accredits hospital cancer programs. Among the different survivorship standards (ION, ASCO, ACS, COC), only COC has a penalty for noncompliance (i.e., it withholds accreditation). c. Increased financial toxicity is the flip side of survivorship. Increased survivorship for longer periods mean older cancer patients and therefore more potential for comorbidities and financial toxicity. Survivorship may be seen as chronic care. Cancer is different because it is complex, multi-modal, multi-disciplinary, toxic, expensive, and often poorly coordinated. Cancer treatment also usually occurs in isolation from primary health care delivery. The result tends to be a massive information overload for both providers and patients. Compared to individuals without a cancer history, survivors have a greater risk for additional cancers and chronic conditions, healthcare expenditures including out of pocket spending, and limitations in the amount or kind of work they can perform. Increasing costs of cancer treatment have resulted in more high-deductible insurance plans, increased patient cost sharing among the insured, and increased bankruptcy compared with the noncancer population. Furthermore, higher mortality has been associated with bankruptcy. Among those with debt, about 90% report psychological hardship. Expenses in addition to medical costs include transportation, lodging, child care, home care, and respite care. This can lead to behavioral financial hardship: taking less medication, skipping meds, delays in filling prescriptions, skipping medical appointments, and refusing treatment. Theresa Hastert (Wayne State U) found a strong association between limiting costs and lowered quality of life (QoL). These effects were strongest for patients who borrowed, had long-lasting debt, and exhibited behavioral financial hardship. Some impact of material financial hardship on QoL could also be due to limiting care. Better discussions are needed about the expected costs/benefits of treatment. Insurance should be designed based on value rather than the cost of treatment (i.e., more bang for the buck should be valued more). Samantha Watson (Samfund) found financial toxicity was particularly prevalent for young adult cancer survivors who have not established financial stability. Treatment means depleted savings, time away from work, COBRA or insurance premiums, and Rx copays. "Asking for help is hard especially once you look fine." Young adult cancer survivors face many of the same issues as other age groups, but in different ways and all at once. Young adult cancer survivors are $100K behind their peers in average net worth. They are more likely to skip meds and appointments and to default on bills. Cathy Bradley (U Colorado Cancer Center) found that many cancer patients continue to work so that they can maintain their health insurance and their income. They tend to work longer; 8-11% perform more work than their noncancer counterparts if they depend on their job for health insurance. Longer survival also means longer and more expensive therapies, which in turn affect functionality in the workforce. Spouses and caregivers are also affected, working decreased hours during treatment and then increased hours afterward in order to keep insurance. The gig economy does not include protections (fringe). In addition, employers are cutting coverage. Among 18-64 year olds, cancer causes a $10-16 billion annual net productivity loss. Impact on work must be part of the treatment decision making process. Workability must be seen by clinicians as quality of care. Working conditions impact survivability. Most research on working conditions has been on women with breast cancer. BC patients indicated they requested special equipment; usually this just meant requesting a laptop. Even well-intentioned employers don't know what to do and often do the wrong thing, so effective workplace interventions are needed. Education must be provided to patients (re expectations and time away from work), employers (re accommodation and benefits), and clinicians. There are >1000 nonprofit resource organizations in the US. Resource providers have their own rules and guidelines (e.g., whether a patient is homebound or not), but the social worker (LCSW) mediates between patient and resource to bend rules where needed. This mediation can be crucial for meeting basic needs like food provision, especially since patients can be unwilling to ask for help. Resources can be financial, legal, spiritual, and nutritional. Coverage ranges from patient navigators to federal and state programs and organizations to clergy. Cancer Care has a Helping Hand searchable database; enter your ZIP code to find resources near you. "Are we creating a premature aging syndrome?" Does treatment accelerate aging? Does it combine with disease characteristics to accelerate aging? There is a frailty phenotype (e.g., shorter telomeres in survivors). "How do we integrate geriatrics into oncology?" The years 2010-2030 will experience the largest growth in 65+ and 70+ age groups. In 2030 the largest growth will be in 80+ age groups. There is a rapid rise in cancer incidence: 67% in patients 65+; most survivors are older adults. Clinical trial data are limited because most patients studied are younger. Main patient concern: "Will I become frail?" (e.g., weight loss, weakness, poor energy/endurance, slowness, low physical activity). Frailty is a predictor of death, hospitalization, falls, ADL disability, decreased mobility. Patients say they would rather die than take treatment that causes functional impairment (74%) and cognitive impairment (88%). Older adults are at risk for cancer therapy toxicity. Need to ID which older adult is at that risk because the risk is not the same for all. Can we anticipate toxicity risks? Factors other than chron. age predict morbidity/mortality in older adults. A geriatric assessment measures functional status, comorbidity, cognition, nutritional status, psychological state, social support, other meds. In a geriatric population, predictors of toxicity are more complicated than a single question can answer. Hurria and her team developed a short geriatric assessment tool for oncologists that can be self-administered by the patient. Team asked patients whether they were asking the right questions and checked for appropriateness of length, number of questions, comprehension, and emotional impact (i.e., the questions were not upsetting). The tool measured impairment, made an assessment, and generated recommendations (e.g., PT, exercise, meds assessment). Team developed a touchscreen assessment to collect data electronically. Automated results include potential interventions and generation of a chemo toxicity risk score. The tool can be accessed at www.mycarg.org. Within Medicare, $35 billion is spent for cancer treatment alone. Cancer costs are highest during the initial phases of treatment and in the last year of life. There are currently no established billing codes categorized specifically for survivorship care, but oncologists may be able to bill in other ways, such as billing by time for monitoring for and managing physical late effects, and providing health education and counseling. Home health is covered, but the patient must be homebound and Medicare does not cover 24-hour care, meals delivered to the home, homemaker services, or personal care. PT and OT are covered for "medically necessary" services and is limited by spending caps. Mental health coverage includes depression screening, psychotherapy, counseling, psych. evaluation, meds management. Wellness programs and counseling are traditionally not covered. See https://www.cms.gov/medicare-coverage-database for regional differences. Smoking during cancer treatment reduces the effectiveness of that treatment. The cost of failure of cancer treatment due to smoking is estimated at $3.4 billion (across 1.6 million cancer patients at smoking risk). Most oncologists will discuss smoking and risks but will not discuss cessation support due to lack of time/resources and lack of expertise. Also, doctors do not want to provide cessation support themselves. They want others to have training, either inside or outside the clinic (no preference). You need ask only one question to assess smoking risk: "How long has it been since you smoked a cigarette (even 1 or 2 puffs)?" Most patients contacted by a call-in cessation program agreed to participate. A call generates a much better result than a mail approach. Onsite phone cessation programs had the best result. The earlier the intervention, the better the chance of cessation. PCPs should be involved prior to any handoff to oncologists. The American Cancer Society (ACS) has guidelines on activity and nutrition. Cancer-specific barriers include side effects, fatigue, uncertain therapeutic benefit, and the desire to resume normal life. Patients new to exercise should start slow, at any time that's convenient for them. It also helps to recruit a friend, set a goal, track progress (e.g., via Fitbit), and use community resources. The bulk of evidence in obesity studies is for breast cancer patients. Patients with obesity had a 41% decreased overall survival, with similar results for ER+ and ER- cancers. The higher risk of cardiotoxicity in patients receiving anthracyclines exacerbates this: more comorbidity in obese patients also affects overall survival. Women on a lowfat diet had better DFS, but they also lost weight (confounding variable). A study of BC survivors who had a weight loss intervention posttreatment (counseling w/dietician w/telephone and email contact between sessions) showed a significant difference in physical functioning at 6 mos. (control group physical functioning decreased); Also, the intervention group experienced fewer new medical conditions at 12 mos. relative to controls. No difference was seen at 24 mos. BMI is an imperfect measure of body composition (e.g., bodybuilder vs sedentary person). In a study of colorectal patients, low muscle = poorer outcomes. High adiposity + low muscle = worst outcomes. ASCO has a weight loss guide for providers and a booklet for patients. Higher protein intake is helpful for older individuals. Some studies show a clear association between ADT and mild cognitive impairment, and a potential relationship between ADT exposure and dementia. Other studies disagree. This could be a question of definitions. Hard to tease apart endocrine therapy and chemo as to what causes decrease in cognitive function. No interventions have been currently proven to reverse cognitive decline. Breast cancer patients treated with AIs and Tamoxifen experience a low risk of cardiac effects. That said, cardiovascular disease (CVD) is the leading cause of death in BC survivors. Fragility fractures are associated with increased mortality. The World Health Organization (WHO) provides a fracture calculator to calculate risk alongside date from bone density tests. Immunotherapy is a novel mechanism of action, given for an extended treatment period, with unique toxicities. The question, "When do we stop therapy?" is an increasingly important one. Immunotherapy trials have been conducted mainly for melanoma. The survival curves for patients who discontinued treatment due to toxicity are practically identical to those who completed treatment, so discontinuation trials are needed. There is the question of whether patients are being treated for too long vis a vis toxicity. Any bodily organ is at risk of inflammatory side effects. When treating side effects (SEs), a long steroid taper is required. Patients also have a risk of late onset SEs, such as diabetes. Many advanced cancer patients believe "survivorship care" means care after therapy is discontinued after treatment with curative intent. They do not identify with the term "survivor." At the same time, their fear of recurrence resembles that of early-stage patients. They need a point person familiar with multidisciplinary avenues of care. Pre-immunotherapy counseling needs improvement, particularly with respect to fertility and family planning issues for younger patients. Younger patients have unique needs. Survivorship numbers for chronic myeloid leukemia (CML) are expected to climb dramatically due to TKIs. PCPs miss adverse effects because patients have left their oncologist's care. Most SEs can be avoided or easily managed. The 5 common stages of CML are crisis, hope, adaptation, new normal, uncertainty. Patients ask, "Will I be on this therapy forever and how will this affect the rest of my life?" Financial toxicity affects adherence. Copays range from 3-figure to 6-figure/yr. Areas to consider include dose optimization (do you need full dose?) and discontinuation (time to get off med? i.e., treatment-free remission guidelines). Intense monitoring is required in case the patient needs to resume the med. Patients want more information and are afraid to stop even with long-term remission, due to fear of consequences. 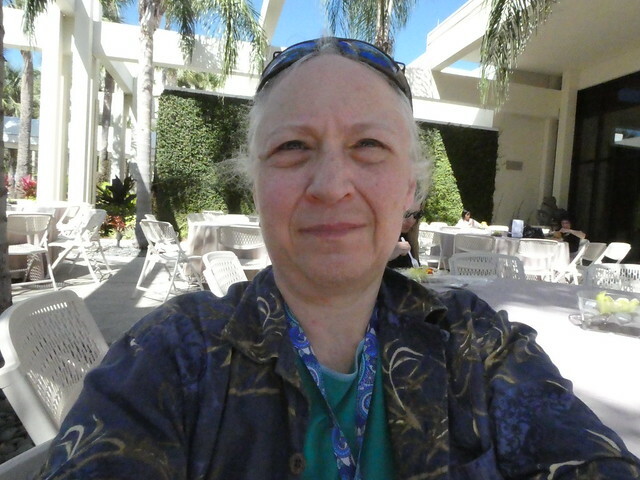 I sit outside the Hyatt Regency Grand Cypress resort in Orlando, where the symposium occurred.